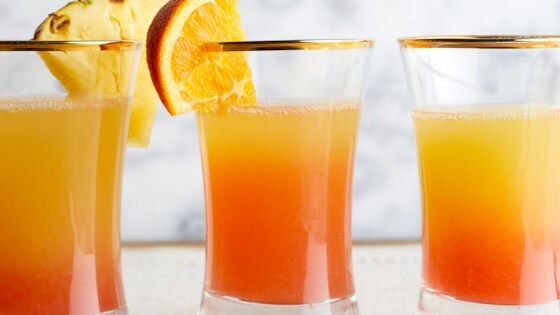 "These simple, sweet mimosas are great for brunch. For a virgin version, substitute club soda or citrus-flavored sparkling water for the prosecco, and use grenadine instead of Campari." Stir pineapple juice, orange juice, and lime juice together in a large pitcher or punch bowl. Add pineapple, blood orange, and lime slices. Cover; refrigerate 2 to 24 hours. To serve, pour 1/2 cup juice mixture into each glass or champagne flute. Add 1/4 cup Prosecco per serving. Slowly drizzle in 1 teaspoon Campari. Garnish with a fresh pineapple or orange slice, if desired. Followed the simple recipe and they were very tasty/smooth! !